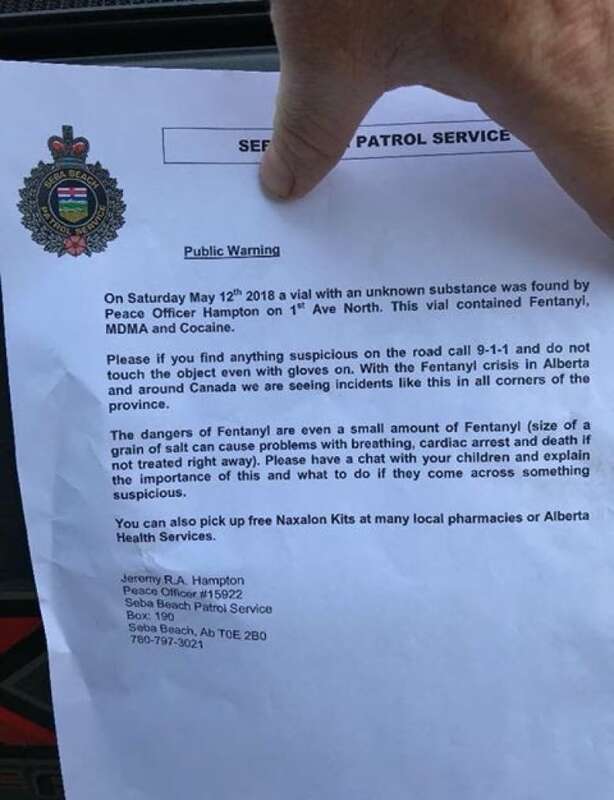 Warnings are being issued in a summer village west of Edmonton after an Alberta peace officer was exposed to the dangerous opioid fentanyl while patrolling the streets. 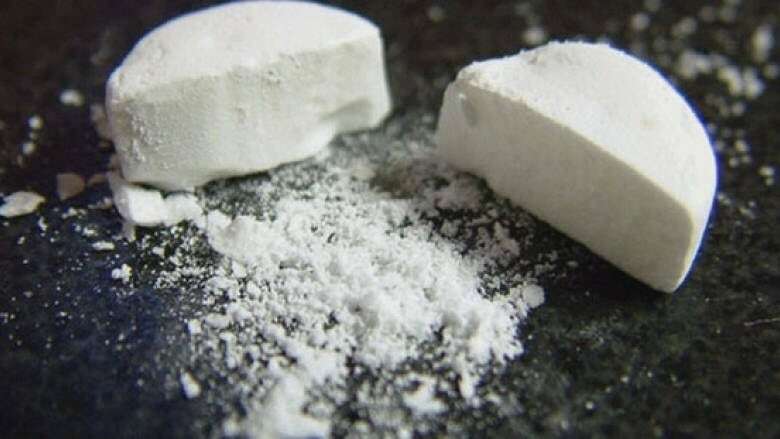 Warnings are being issued in a small summer village west of Edmonton after an Alberta peace officer was exposed to the dangerous opioid fentanyl while patrolling the streets. Jeremy Hampton, a member of the Seba Beach Patrol Service, was rushed to hospital after he picked up a vial of powder he found Saturday on a road. Seba Beach is 90 kilometres west of Edmonton, on the western shore of Lake Wabamun. "He was just out on regular patrol when he noticed there was a vial on the ground," said Dwight Dawn, president of the Alberta Peace Officer Professional Association. Hampton picked up the vial using rubber gloves. Soon after, he began having breathing problems and an elevated heart rate. "He got back to his office and started noticing the symptoms," Dawn said. "Fortunately for him, he was carrying a naloxone kit on him and was able to inject himself." Hampton was taken to hospital and treated with further injections of naloxone, which can counteract the dangerous effects of fentanyl. RCMP were brought in to investigate and officers found traces of fentanyl on the dashboard of the peace officer's car and on his ticket books, Dawn said. The vial contained MDMA, cocaine and fentanyl. "We're not not too sure exactly how the inside of the vehicle got contaminated or how he got contaminated. It's just one of those things," Dawn said. "It's a very dangerous substance. "As much as we try to be cautious with it, it takes very little for this to float around in the air and get contaminated." After a couple days off the job, Hampton is back to work and "doing fine," Dawn said. This week, Hampton posted notices around the village about 80 kilometres west of Edmonton, warning residents and visitors about what happened. "Please, if you find anything suspicious on the road, call 911 and do not touch the object even with gloves on," reads the notice. "Even a small amount of fentanyl (size of a grain of salt) can cause problems with breathing, cardiac arrest and death if not treated right away." The note goes on to caution people to talk with children about what they should do if they find anything suspicious. Dr. Nick Etches, a medical officer of health in Alberta Health Services' Calgary zone, declined to comment on the specifics of the case but said accidental exposures are "exceedingly rare." "We have absolutely no record of members of the public experiencing an accidental exposure to fentanyl," Etches told CBC Radio's Edmonton AM on Friday. "The risk of fentanyl exposure through a glove, if someone were picking up needle, is negligible." A person would have to be exposed to a "sizeable amount" of the drug to experience an overdose, Etches said. "This isn't something that would happen by getting a little bit of powder on their hands," he said. "To be exposed through your skin takes a long time, upwards of an hour." While the risk of accidental exposure to general public is very small, there is a high risk that needles and other discarded sharps could be carrying blood-borne diseases like hepatitis, he said. "When you're seeing a needle on the ground, the main reason not to pick it up isn't to do with fentanyl exposure. It's to do with avoiding poking yourself and exposing yourself to infection." Dawn said it's common for his officers to find discarded needles, syringes and drug paraphernalia on the streets. He said the Seba Beach incident is a reminder of the importance of community awareness and access to naloxone kits for patrol officers.. He said his officers will be "extra cautious" as visitors flock to the village on the May long weekend. "It's becoming very prominent in all areas of the province," Dawn said. "It's in small communities, counties. It's everywhere."